To assure I got a good seat, I was the first in what wasn't much of line. Once the room opened, I sat at a table that I later realized wasn't such a wise choice. The Doveman shows are done "in the round" which invariably means that some of the performers will have their back to the audience. "In the round" is definitely a good choice for the show, but it doesn't always make for great pictures from the audience. In fact, during the show Mike Doughty pointed out to Thomas Bartlett (Doveman) that he had reserved a table for his family that only allowed them to see the backs of the guest performers. I was seated two tables away from them. At 3 minutes after 8, Doughty walked out to start the show with a song by Randy Newman which he performed by himself on piano. That first song as well as the rest of the show seemed a little more somber than usual and actually kind of fit in with the overcast drizzly weather we were having that evening. Friday night's show was a little different from the prior to shows. There were no horns (sax, trumpet, clarinet etc.) and there was a different rhythm section, namely Josh Kaufman on bass and Ray Rizzo on drums. Bartlett asked Lisa Hannigan to come out and explained that they had both worked on a tribute to Kate McGarrigle. He explained that Hannigan sang "Tell My Sister" for the tribute, but since then he's been accompanying McGarrigle's daughter,Martha Wainwright, who has been singing it on a regular basis. Bartlett boasted that since he's been playing the song so much that he plays it really well. I had heard the recording of "Tell My Sister" when Anne McGarrigle was interviewed on NPR's Fresh Air. Hearing it again sung by Hannigan was a real treat - she sang it beautifully. (You can hear the interview by going to http://www.npr.org/2011/05/11/136141819/anna-mcgarrigle-on-life-without-her-sister). Before seeing Lisa Hannigan perform, I'd forgotten that I'd already heard her on a Damien Rice CD titled "Live from Union Chapel." According to Wikipedia, Hannigan collaborated with Rice from 2001 until going solo in 2008. I'm not sure but I think the three songs that followed on Friday night, are songs Hannigan has written for her next CD, since none of the songs were from her 2008 CD "Sea Sew." During the beginning of Hannigan's next song, "Little Bird," Bartlett plucked at some the strings on the inside of the baby grand piano he was playing. The tight sound of the strings added small nuances to the what Hannigan was playing on mandolin and was further enhanced once Rob Moose joined in with violin. As I listened, there was something about the timbre of Hannigan's voice that reminded me of Melanie ( "Lay Down," "What Have They Done to My Song-Ma," "Brand New Key"). Glen Hansard joined Hannigan for the next two songs and traded his guitar for her mandolin for the latter of the two. As Hansard was setting himself up on stage, Bartlett told the audience about almost being kicked off a Damien Rice tour after drinking wine that was in Rice's dressing room. Apparently, the tour manager was unaware that Rice had given Bartlett permission to take some of the wine. Besides killing time, the point was that incident reminded Bartlett of when he and Hannigan first met. The song "Passenger" had a lighter feel to it then the previous songs with the band eventually joining on the second verse. Once Hansard had the mandolin in hand, Bartlett teased him by asking "Are you gracing us with your mandolin stylings - Glen?" Hannigan introduced the song "Safe Travel" as just some musical tips for life. The song had a sweet waltz feel to it and an sarcastically maudlin hook that repeated the line "Safe Travel - don't die, don't die." Thomas Bartlett (Doveman) performed two of his songs, the first from his CD "The Conformist" and the second from his CD "With My Left Hand I Raise The Dead." Hanna Cohen and Dawn Landes joined Bartlett by providing background vocals. I liked both songs but especially the first which was "Breathing Out" with it's pronounced chorus and it's whispered harmonies. Hanna Cohen next did one of her own songs. Bartlett introduced it by stating the they had been working on her recording together and were currently at the mixing stage. 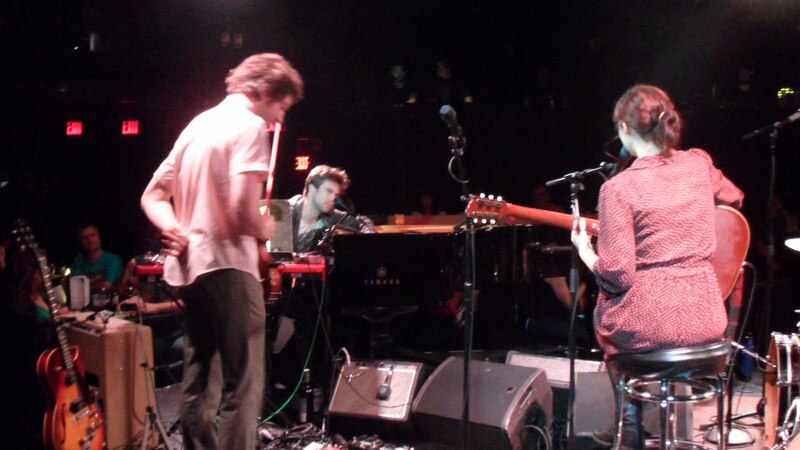 Before doing the song, Cohen critiqued the show by saying "it's a beautiful show so far." She was right it had been and continued to be. If Cohen said the name of the song, I might not have caught it but I believe the title was "Sorry." There were a few stops and starts because Cohen was getting small shocks from the microphone, but once Cohen got going it was pretty cool song though a bit short. Thomas Bartlett next introduced Mike Dougthy as an old friend and stated that the first proper tour he ever went on was with him. Doughty quickly rebutted that statement by asking "is there any way in which that tour can be termed proper?" Both Bartlett and Doughty then reminisced about eating at every Cracker Barrel across the US and Doughty ribbed Bartlett about being a Cracker Barrel recording artist. Bartlett told the story of being on tour and finding himself listed on a CD released by Cracker Barrel. The CD was from a session which Bartlett forgot about but was hired to play for in Philadelphia two years prior. I have to admit that I was curious about Mike Doughty because all I knew about him was the 90's song "Super Bon Bon," which he did with his band Soul Coughing. My curiosity was cured by the fact that he did 3 well written songs with unusual but interesting titles. The first song "White Lexus," was done with just Doughty on vocals and Doveman on piano. The song was a ballad with a feel that made it seem like a church hymn. Doughty did a bit more reminiscing by mentioning that he used to call Bartlett by his "nom de guerre" - Doveman. However, when they were on tour performing at Vassar College, everyone thought Doughty was calling Bartlett "Duffman." The audience chuckled and Doughty admitted that he thought what people misheard was hysterical before doing his songs "27 Jennifers" and then "Unsingable Name" with the band. I'm not sure what it was about but on the day of the show there was a tweet by Doughty. It said if people did not want to hear him and Dawn Landes do a John Denver song, they should stay home. I thought it was weird but wondered if he tweeted to piss someone off or if he tweeted to encourage people to come to the show by using reverse psychology. Doughty, Landes and the band performed "Country Road." It was fine. I guess I will never know what the tweet was about. Bartlett mentioned that the evenings rhythm section was "stolen" from Dawn Landes and then asked her to do a song. Landes sang "Little Miss Holiday" from her 2009 CD "Sweetheart Rodeo." Landes is originally from Louisville, Kentucky and since her song was very country, it worked well after the John Denver cover. Doveman started playing his "Boy plus Angel," but then stopped and said "Rob is going away and I don't want to play this song without Rob." Rob Moose had walked over to the earlier mentioned family table but quickly returned to the stage when Bartlett let it be known he was needed. Bartlett began the song by plucking at piano strings as he did earlier. It was an interesting sound that I usually expect to hear as sampled on a synthesizer rather than actually plucked out on piano strings. Needless to state, but I will anyway, Bartlett's piano and Moose's guitar made for a wonderful song. Glen Hansard came back up and did two more songs. Bartlett mentioned that Hansard had done 4 or 5 of The Burgandy Stain Session shows at Le Poisson Rouge. Hansard introduced drummer Ray Rizzo to start off the song "Show Yourself To Me," which I believe is one of Hansard's newer songs. The song's title is a command which works as really powerful refrain each time it comes around. Hansard made the crowd the laugh because he introduced "Show Yourself To Me" as a song about not being able to commit and then introduced "Maybe Not Tonight" the same exact way. "Maybe Not Tonight" was my favorite song for the entire evening. There was something about the guitar intro and the feel of the song that felt very Beatlesque. The feel actually reminded me of "Don't Let Me Down." The encore ended the show as it started, somberly, with Glen Hansard & Lisa Hannigan singing a beautiful duet. Now, that I have been at three of Doveman's monthly shows at Le Poisson Rouge, I can safely state that each show is somewhat different than the one before and always worth seeing for the musical talent hosted by Thomas Bartlett.